I created eight (alike) Artist’s Trading Cards (ATCs) to trade with my Craft Stamper group that meets monthly. 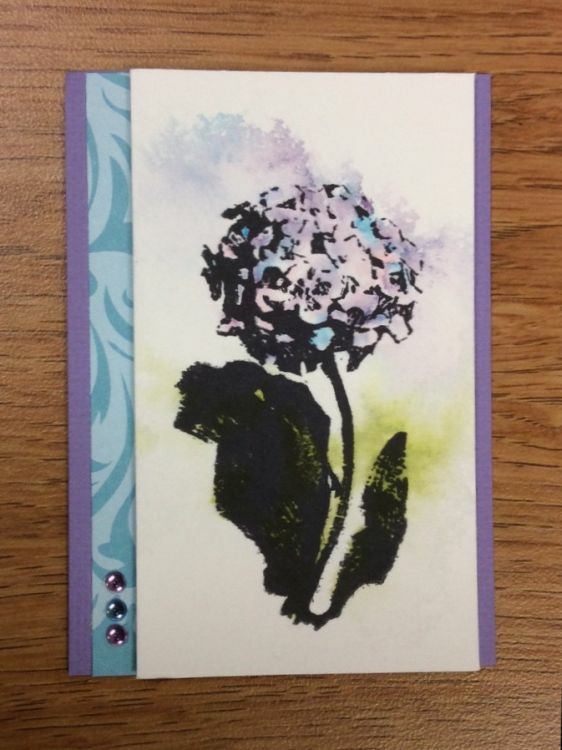 This technique was featured in the May 2015 issue of Craft Stamper magazine. This technique works really well with imagery that is not perfectly representational since coloring your image is not necessarily within your control. The watercolor medium is Distress ink via Distress markers, with a spritz or three from a water bottle! Thanks for stopping by today. This entry was posted on Thursday, May 21st, 2015 at 12:00 pm	and tagged with distress techniques, flora, penny black, stamping, watercolor and posted in Artist's Trading Cards, Craft Stamper, Distress Techniques. You can follow any responses to this entry through the RSS 2.0 feed. Beautiful ATC, looks like a fun technique.